My first encounter with Martial Art, like so many others, was Bruce Lee as the Green Hornet's chauffeur. It was amazing what that little guy could do with his hands and feet. It was also about the time I started to travel a lot for Lockheed. And as it was with my nature, I wandered into places it wasn't very safe for a white guy in suit and tie. After a couple close calls I decided that I needed more useful training in defending my self. I had boxed in collage and wasn't too bad at it, but my close calls taught me I needed more fire power. I was an excellent shot with a rifle or handgun, but most authorities frowned at citizens traveling around with that type of fire power. So thanks to Bruce, I looked to martial arts. My first association with martial arts was the Lockheed Judo and Aikido clubs in the late 60s. That is were I met Bob and Brian Rainie which sprouted a relationship which has lasted to this day. I enjoyed Judo and Aikido but after a while I found these two martial arts were not what my nature needed. So, I looked again this time into the commercial world. I had seen Kempo demonstrated, and beside it was somewhat like Lee's Kung fu, so I studied it for about year of 1968 along with Judo and Aikido. Where I was studying Kempo turned out to be too commercial. They were in business mainly to collect fees and sell belts. For my time spent I learned very few fighting techniques (blocking, punching and kicking), mostly self-defense techniques patterned after animals or insects. Today I have found those old techniques very useful now that I can't block, punch or kick like I used too. Concluding Kempo was not for me, I again looked to the commercial world but this time I knew that the martial art I needed was to be the hand and foot way. 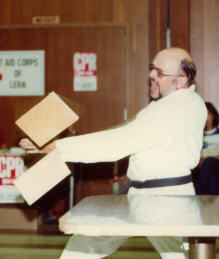 In 1969 I found what I was looking for at a small struggling Shotokan (Okinawan Karate) school in Cupertino owned by Jim Mather, "The Arrow Catcher". Mather was, and still is, one the most fascinating people I have ever met. A slight man, almost fragile, at that time. He turned out to be the fastest person I have ever seen next to Lee. He understood the physical mechanics of the muscles and how to develop them to produce blinding speed and how speed could produce power. I found something else in him I had not been aware of in martial arts before, internal power or Ki. He and I, as we were close to the same age and several years older that any one else at the school, would spend hours in his office discussing the history, philosophy and techniques of Shotokan. I was beginning to see there was so much more to martial arts than speed and techniques. The year and almost a half I studied with him I learned so much about sparring, competing and Ki that I have relied on ever since. As fate would have it, my love for motorcycles cost me much of the use of my left knee spelling the end of my Shotokan career. It took two years of work to get most of the use of my knee back were I could start working out again. The knee would still give out now and then, but I could still get some work done. Mather was not teaching any more. He had moved on to other things, catching arrows and working on a Masters, and eventually a PhD, at Stanford. So in mid 1972 I decided, with the help of some old friend from the Shotokan School, to start a Shotokan Club at Lockheed through LERA (Lockheed Employee's Recreational Association). As I was talking to LERA about my club, I had a call from Bob Rainie. Bob had heard through LERA what I was planning and as he was planning to start a Tae Kwon Do Club, he wanted to know if I would be interested in helping start the Club instead. He had met a 5th Degree Black Belt in Tae Kwon Do from Korea, Ui Jung Kim, pumping gas in Campbell who had agreed to teach at the Club an early form of Tae Kwon Do called Han Moo Kwan. So, in February 1973, in the lobby of the old Gun Club, the Han Moo Kwan Tae Kwon Do Club was started. It didn't take long to see that there was a great deal of knowledge and Ki in Mr. Kim, even more than there had been in Mather. He also was a purest, wanting only to teach not make money. A sense of family was more important to him than being a martial arts guru. It was easy to develop a high respect for Mr. Kim and a desire to learn all he could teach. The rest of my history is the club's history. The knowledge and spirit I have gained from Mr. Kim as well as all the friends and acquaintances I have had through the Club has made my life much easier and better equipped to deal with it. I miss him and wish he was here to council me from time to time.